Christine Porter teaches various printmaking classes. They can be taken as weekend workshops, longer schools, individual tutorial or ongoing classes. Scroll down for those already written but note that this is not an complete list: Christine is happy to work with you to create learning experiences that match the needs of your artists. Contact us directly to discuss, or to book a workshop. 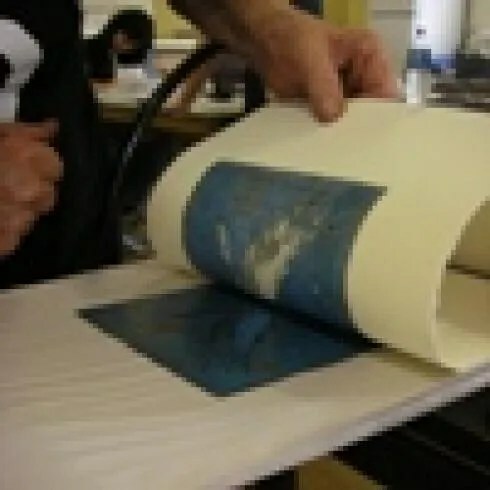 These workshops are about the printing part of print-making. Explore the many different ways of printing in COLOUR from the plates created during the workshop (various drypoint and engraving techniques on a number of different surfaces) as well as from student’s own, already etched, plates. Using artists’ previously etched plates the workshop is a time of experimenting with ways to add colour easily without having to etch more metal. Suits the experimental printmaker who wants to create a variety of marks easily, or the scientific printmaker who likes to test images first. A full day or days of technical interrogation. 2-3 days to literally print a single plate in 50 variations. Using basic drypoint plate techniques on a variety of household surfaces to create instant plates for sketching with, or for secondary layers on multi-plate prints. SKETCHING TOOLS FOR WORKING EN PLEIN AIR. Taking the sketching plates out in the open, sketching and bringing them back into the studio to work up into finished artwork or artist books. Tools, methods, tricks, challenges. – different methods of inking and printing plates using the student’s own, or previously etched plates. Suits those who work in multiples or in unique states. Includes inking intaglio and relief; masking, dolly wiping and more. All of Christine’s 125 editioned etchings use coloured inks even those printed from a single plate; most incorporate dolly wiping and blending over several plates. -other printmaking topics such as: which ink does what, how different colours, pigments and brands differ, using white and black ink, materials other than ink, multi plate colour etching, developing narratives within the final image, safe workplace practices AND MUCH MORE. 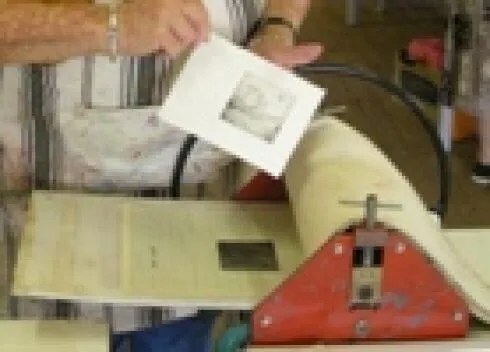 -how to make a simple drypoint plate, using a number of techniques on a number of different surfaces, including readily available, inexpensive, household materials. Christine uses metal and acid in her own practice but has developed teaching methods that result in quick results allowing for more information to be taken back to the artist’s studio. Christine’s teaching strategies include demonstration and explanation. Because these are technical workshops, she has developed strategies for building success for everyone. Working small at first, each student creates a library of marks and techniques – compiling their many inking, wiping and printing experiments into a self printed, studio resource book. Some students may create their own individual projects if the time permits: others may take the time to simply experiment further. 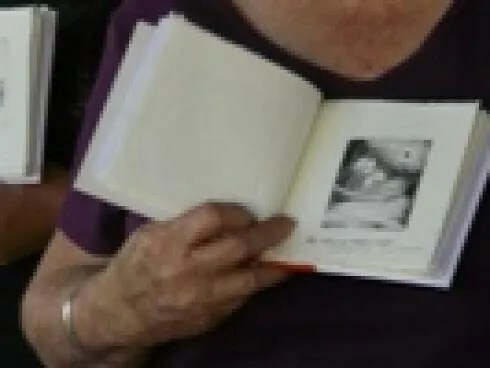 people who’ve never made a painting, etching or even a singe piece of art before in their whole lives. This is a workshop or short experience which aims to get non-artists making art and having fun doing it. Using drypoint as the medium, each participant makes a simple plate then prints a number of variations. This format works well in a community access situation. special interest groups such as scouts (etc). type – 1/2 or 1 day workshop. Community access situation such as market or fair. class size – For every 10-15 students there needs to be enough space and a press. For larger groups extra support may be required. 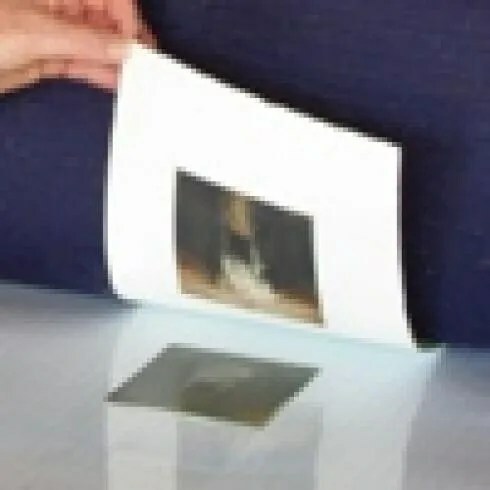 Solar plate printing is when the photo-sensitive surface laid over a metal plate is manipulated with UV light in order to create a new surface that is sturdy, waterproof ready to be wiped intaglio or relief. This precludes the use of acids traditionally used to etch a metal plate and makes for a safer studio. From this new technology have come new and exciting ways of making a mark including using found objects and “drawing” with a photocopier.The materials needed for solar plate are more expensive so the materials fee per student is more than for other printmaking workshops. how inking and printing this type of plate differs from a conventional metal, plastic or paper plates. This two or three hour workshop is a hands–on chance for teachers to experiment with ways of printing drypoint with specific information about how it can fit into the high school or primary school classroom. Includes afternoon tea. For more information go to The artist in the classroom. Some workshops will need access to a plain paper copier. A desk top copier is adequate. Sometimes Christine may be able to bring this piece of equipment. Equipment needs will be discussed prior to the workshop. 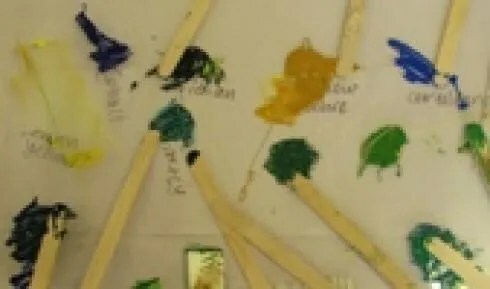 The class usually uses oil based inks so women who are pregnant or breastfeeding will not be able to take part. As water-based inks become available, Christine will be including them. Please advise Christine if you are sensitive to any chemicals such as citrus. 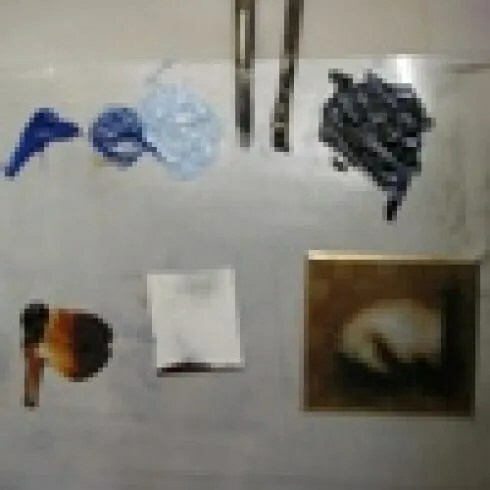 Images or ideas for artwork, some tools and equipment.